2018 The Astrophysical Journal Letters 869 L7. Recall (top) and precision (bottom) as a function of MES, which is a measure of the signal-to-noise of candidate transits. 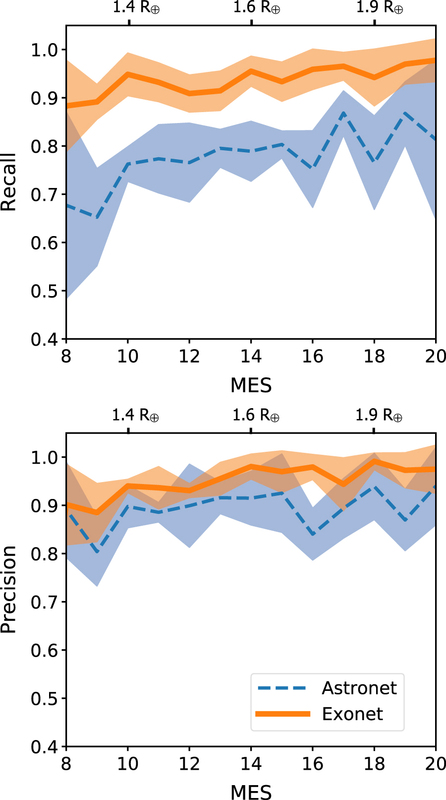 The Kepler pipeline only reports MES > 7.1 and the cross-validation k-folds sometimes did not contain any planets with MES < 8, thus here we only plot MES ≥ 8. The solid lines are the averages of the cross-validation k-fold results, while the shaded regions show their standard deviations. We use a threshold of 0.7 to calculate the individual recall and precision values. The top axes show the median planet radius for confirmed/candidate KOIs in three MES bins, illustrating that the gains in performance by Exonet can be most significant for Earth-sized planets.